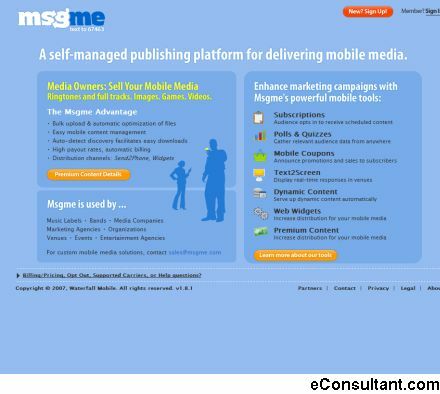 Description : Msgme is a mobile messaging platform that gives content owners the ability to add mobile interactivity to their current marketing – online, print, broadcast, or in-venue. The easy-to-use web interface makes self-publishing effortless and gives content owners the power to create flexible mobile campaigns, customize their content delivery and send broadcast messages to their fans, customers, constituents, and friends. In seconds, Msgme can help you create a mobile presence for your company, brand, organization, political campaign, or band.